Binding just got easier. Exclusive Guide Right� ; feature ensures accurate punching every time. New front and side guides ensure paper is aligned before punching. Compatible with regular and oversized covers. One-touch electric punching up to 20 sheets. 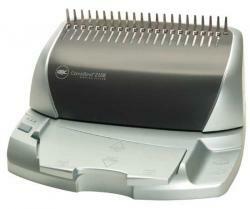 Get traditional style and up-to-the-minute versatility in one efficient electric binding system. With CombBind� binding, pages can be added or removed at any time. Bind capacity of 425 sheets. All capacities are based on 20-lb. bond. GBC is manufactured by ACCO Brands. ACCO started in 1883 and soon revolutionized the offices, schools and work spaces by creating ring binders, paper clips, and the staplers. GBC is a leading manufacturer of paper shredders, laminating machines, binding machines and report covers and folders. GBC�s flagship shredder, GDX1813 Cross-Cut Jam Free Shredder, is popular among offices. It has an incredible shredding capacity with the ability to shred a variety of non-paper items. In addition, GBC takes pride in producing the world�s fastest laminator known as HeatSeal QuickStart H420 and H320 which is jam free and laminates 14 letter sized documents based on total time taken from �power on�. GBC is committed to create strong and successful brands that will be recognized worldwide as market leaders. Having a strong focus on the future, it realizes that it is very important to strive and improve the value and competitive position of its products. It leads the way in providing document security solutions for every office and personal need. Binding machines bind a book together. They are mostly used in educational institutions, offices, book publishing, advertising and marketing industries. There are many different types of binding machines. Binders can be manual or electric. The can be velo binding, comb binding, and pro click. Akiles and GBC manufacture quality binding machines. Max Plastic Comb Diameter 2"
Dimensions (L x W x H) 16"; x 14"; x 9"
"We ordered a GBC electronic binding machine from Clary business machines on line. The price was excellent, order shipped and received promptly. We have only had the machine a few days, but it works great."